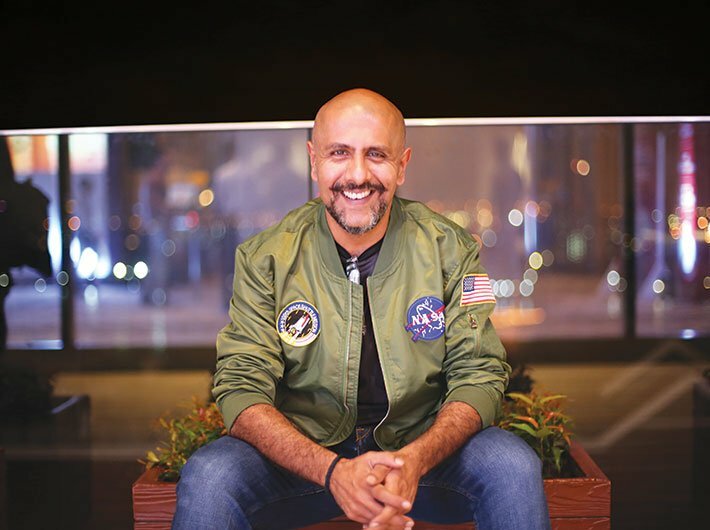 Vishal Dadlani is a versatile musician who composes, sings as well as writes lyrics. He is the co-founder of electronica/indie-rock band Pentagram – the first Indian band to perform at the Glastonbury Music Festival in the UK in 2005. He formed a music producing duo with musician Shekhar Ravjiani in 1999 and produced notable works in films like Jhankaar Beats, Dus, Bluffmaster, Om Shanti Om, Dostana, Student of the Year and Chennai Express. Besides music, he actively involves himself in social and political causes. He was one of the first celebrities to openly support the Aam Aadmi Party. After the 26/11 attacks in Mumbai, he launched a petition to ban live media coverage of rescue operations. In September 2009, he started an online petition against construction of a Chhatrapati Shivaji memorial in the Arabian Sea. How has been your journey into music so far? It’s been fun. There are many, many stories and none of them are short. This question could be answered over weeks. So I’ll just leave it at that. How has the music changed in the industry over the years? I think it has become better. There is a lot of mutual respect within the business. Composers interact and even collaborate. There are literally thousands of new singers, music producers, engineers and instrumentalists. Not only is it more fluid in terms of structure but is more beautiful in terms of melody and depth as well. How does the social and political climate in the country impact your creative expression? In film music, not at all for the most part. Occasionally, we get to do a song like ‘Bharat Mata’ from Shanghai, which is an apolitical look at both the good and the bad in our country. With Pentagram [music band], though, I do a lot of writing based on stuff I want to say politically without preaching because nobody listens to preachers but everybody listens to a song. What can the government do to promote music? I would love to see an active musicians’ exchange programme and an awareness at the government level about the forms of music other than folk, Indian classical and Bollywood. What are the governance issues that matter to you the most? Education is what will slowly help us escape the morass of religion-based politics that is currently being used to divide us. So that has to be the first. Environmental concerns should also be put on priority. There is, of course, the obligation of the nation to provide for the poorest of the poor and the weakest of the weak. Water, electricity, food, shelter, jobs are all crucial. For me, above all, we need an impenetrable wall between religion and governance. We are a secular nation, and must stay one. I live in Mumbai. We have barely any roads left. Just potholes. I’m a victim of misgovernance, every day. All of us are. Fortunately enough, my hobby is my job. What are the future plans for your music band Pentagram? We are writing a new album – our fifth, and we will be touring extensively this season. Three film soundtracks, the Pentagram album, and a project that Vishal & Shekhar are working on in London.